There are many ways for modern consumers to invest in gold. Depending on your circumstances, you might wish to purchase gold through a one-off payment or perhaps you might decide to spread the risk by investing in a monthly saver plan. The flexible nature of gold investments means that you are never short of options when it comes to how you can invest, there are more choices now than at any time in history. If you have the money to do so, then purchasing physical gold or bullion outright is the simplest way to invest in gold. You can buy bullion in two main forms. Either by purchasing gold coins (e.g. Sovereigns) or gold bars. Whilst there are pros and cons to both, it is generally considered easier to sell coins as they offer more flexibility. For example, you can sell one or two coins at a time rather than having to sell all of them. Gold coins represent a great investment opportunity for investors. 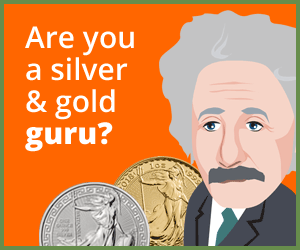 You can either invest in historic collectors’ coins or gold bullion. Collectors coins can provide great returns as they offer numismatic value as well as material value however, they also require a greater degree of market knowledge as their value is based on many different factors, not just simply their weight in gold. Gold bullion coins are the most popular form of gold coin investment as they have a high gold content and a guaranteed level of purity. Certain gold bullion coins are also exempt from VAT and Capital Gains Tax. This includes all gold Britannia coins. Gold bars are a great way to purchase gold in bulk. Investors have several options with regards to weight and can choose from 10g gold bars, 5g gold bars, 100g and 1oz. Many dealers also offer Vat free gold bullion bars with the option to store the bars in their own allocated vaults. One helpful tip you might want to consider when purchasing gold is to always make sure you buy your gold through a recognised broker or professional dealer in order to avoid the risk of buying forged coins. When purchasing gold online or through sites such as eBay, you should always be careful that what you’re buying is exactly as advertised. A monthly saver gold plan is ideal for investors who want to invest in a set amount of gold on a regular basis. If you don’t have a huge amount of funds to invest, or you want to spread the risk of investing over a longer period, then a regular gold investment plan is an ideal option. A monthly gold saver plan offers investors the opportunity to gradually build up a portfolio of gold over time. The main benefit of purchasing gold this way is that investors avoid buying gold while it’s at its peak and don’t have to try and predict future twists and turns in the market. additional security for investors looking for long-term financial security. A self-invested personal pension (SIPP) now allows individuals to benefit from additional tax relief on the cash invested in the plan and you can invest in gold bullion as part of a range of diversified investments approved by HMRC. Since the financial conduct authority added gold to its list of approved assets, investors can now benefit from up to 45% tax relief on gold bullion. For gold bullion to be eligible for a pension scheme it must fit certain criteria. Currently, these criteria extend to all gold bars or wafer with a purity of at least 99.5% providing it is professionally stored. The only potential disadvantage to pension gold is that you don’t own your gold directly as it belongs to your pension fund. This means that should the price of gold go up, you can’t just then decide to sell. Here at Physical Gold, we offer two main investment packages including our regular monthly saver plan and our pension gold plan. If you would like to discuss either of these in more detail or need additional information on any of our other services, please give our experienced advisers a call on 020 7060 9992. This entry was posted in Blog and tagged Gold Investment.